The SUNY Upstate EM Residents are seen here participating in the annual Extrication Training. Residents get the opportunity to work with the "jaws of life" and other extrication equipment in the field first hand under the supervision of the Manlius Fire Department. Fellows in four distinct Fellowship Programs: Pediatric Emergency Medicine; EMS & Disaster Medicine; Wilderness & Expedition Medicine; Undersea and Hyperbaric Medicine. 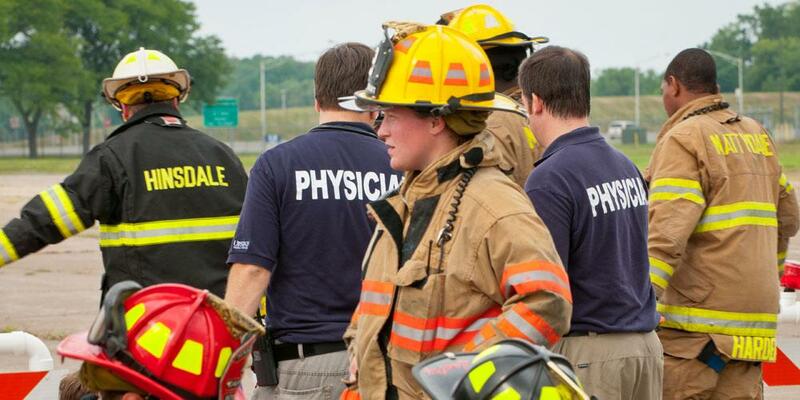 Medical Students receive training from the Department of Emergency Medicine in all four years of medical school, including an Acting Internship where they participate directly in emergency patient care. Residents and fellows enjoy a specialized curriculum and a multi-disciplinary approach to patient care. For the community, our state-of-the-art simulation and training center, EM-STAT, hosts training for the Central New York EMS community with ongoing specialty classes in Advanced Cardiac Life Support, Pediatric Advanced Life Support and HAZMAT life support.